I'd love to see Tom Colicchio and Martha Stewart! 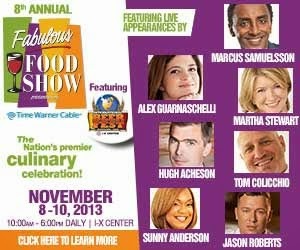 Never been to the food show, would love to go watch Sunny! I really like Alex on Chopped and I think she is a great chef! I'd want to see Hugh. He seems so interesting whenever he pops up on Top Chef! I'm a pretty big Tom Colicchio fan. He is awesome. I'd love to take my wife to see Martha! Martha is great and all but I want to see Tom in all his big bear hotness! I would like to see Martha. YOLO. I'd love to see Tom too! And Martha. You can never have too much Martha in your life! :) I would definitely love to go see her! I want to see Hugh Acheson and Marchs Samuelsson. Seeing Martha would be amazing! I have to agree with you and say Tom! I enjoy going to the show, try to go every year. Would love to see Tom Colicchio! Tom Colicchio hands down winner, wouldn't mind Martha either. My must see is Sunny! Great dishes. Tom Tom Tom!!! He is my fav!!! Sounds like a great event, would love to go! Bet Marcus Samuelsson is gonna be awesome in person! Nice! You always have such awesome giveaways, ha. For me, I'd have to say it's Sunny Anderson! I want to see Alex AND Marcus!! Born in 1991, I did not know a home without a copy of Martha Stewart Living on the coffee table. Instead of watching Rugrats and Spongebob, I asked my mom to tape the Martha Stewart Living show for me to watch when I came home from school. My love for Martha has endured her ups and downs. I remain a dedicated fan and it would actually be a dream come true to see her in person. There is only one....Martha Stewart! I can NOT even begin to imagine the chance to see her in person. I have not been to this event for years but Tom Collichio.....YES!!! I'd love to see Martha. Tom Colicchio - I love Top Chef!! I would love, love, looove to see Martha! I've followered her for years, and have a signed headshot of her sitting on my cookbook stand.